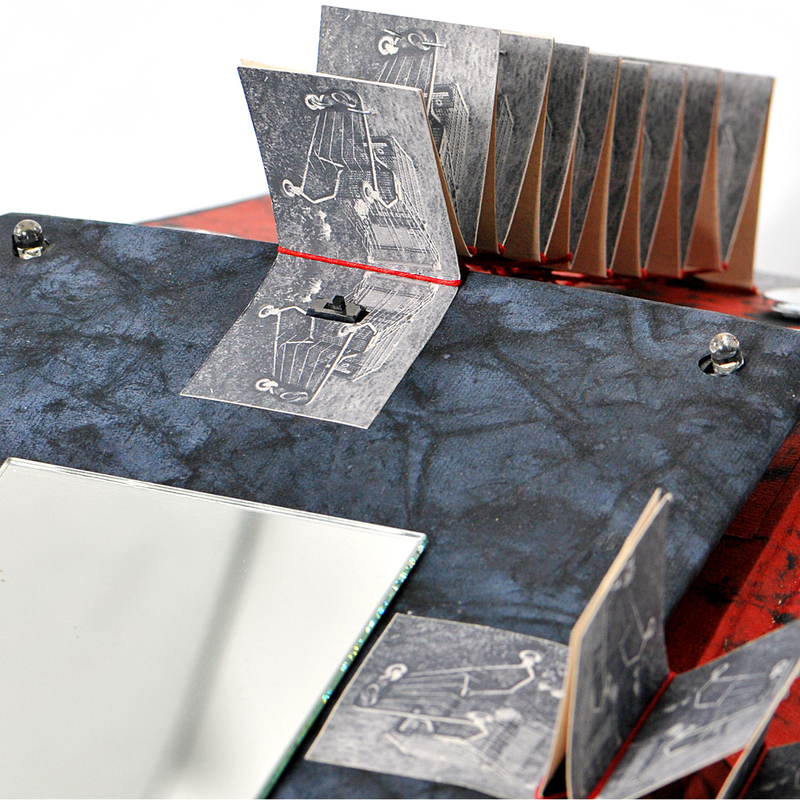 Artist's Books and papercraft installations are one of the ways book arts come alive. They are special because the form, design, materials, illustrations, images and text all work together to create a larger idea or concept. They are so much more than a poem or a painting or a sculpture could ever be because they are dependent on the viewer/reader interacting with the piece...you have to experience it, not simply look at it. 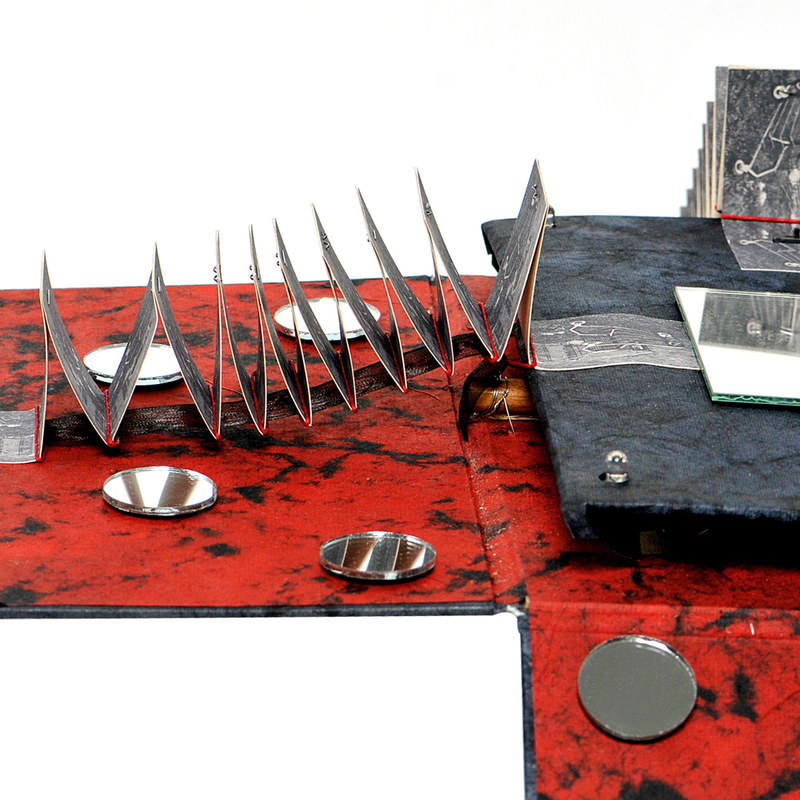 Artist, Janna Willoughby-Lohr, began creating artist's books and paper sculptures as a student at Warren Wilson College and has continued to craft these intricate works of art alongside her commercial work. Many of these works are editions of one and were created to tell the story of her life and to address social issues affecting women in particular. Continue reading to hear the stories behind a few of these special works in the artist's words. Medium: Mixed Media-- 65 individually formed sheets of handmade paper (abaca fiber, gold & silver pigment, mica chips), red finger paint, baby footprints, accompanied by a poem. This piece came about after thinking a lot about guns and parenting in America. Since my second son, Thurgood, was born almost 4 months ago, 447 children have been killed by guns in America. 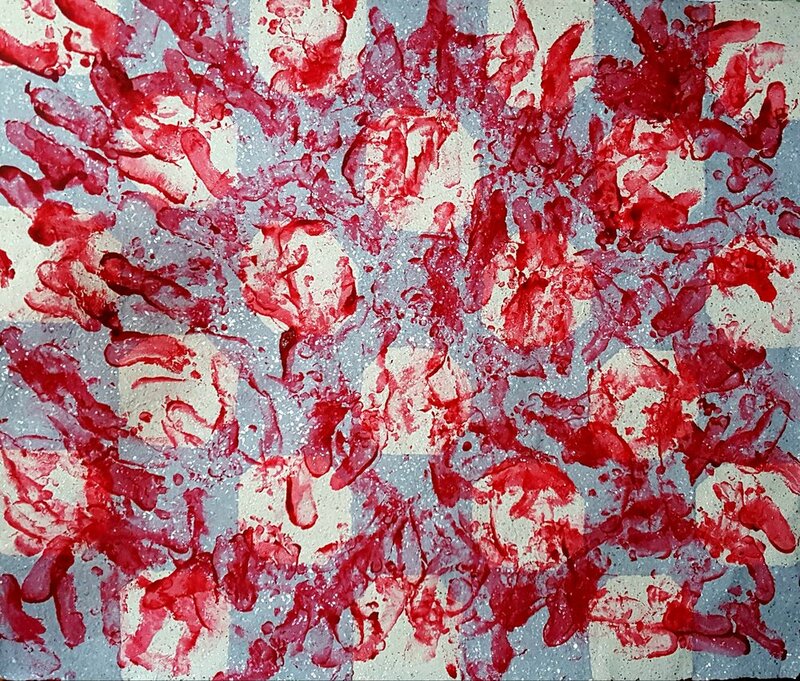 There are exactly 447 of my baby's footprints on this paper rendition of a tile floor--representing all of the young lives lost due to gunfire in his short lifetime. When I think of tile floors I think of kitchens...I think of bathrooms...I think of schools... and malls...and hospitals...I think of my childhood... and linoleum...and the time that I was 5 and the girl next door and I ran across my porch, freshly painted crimson red, and then ran through the neighbor's house, blood red footprints on the chessboard of that poor woman's kitchen tiles...it didn't used to make me think of danger... it made me think of innocence. In the almost 4 months since my second son was born, 447 kids have been killed by guns in America. 447 children shot accidentally or on purpose by other children or adults in homes, in churches, in schools, in shopping malls, in bedrooms, in movie theaters, on playgrounds... in this country. 447 young voices snuffed out because someone in this country was reckless and senseless and careless with their weapons. 447 parents who won't ever hear again their children breathing the soft whispers of sleep. And I'm numb. I hear of another shooting on the news and there's so many that the names of towns all blur together, let alone the names of victims, or their parents, it's all too much to wrap around. And I gloss over, scroll past, watch the videos with the sound off, silent mouths speaking out, I'm sure they're loud but no one's listening. I can't allow the sound of grieving to drill into my ears, I can't let myself imagine a world without my kids. But 447 parents who may have worried about something like this but never really thought it would happen to them are reeling, unwillingly surviving, digging deep holes and placing their babies inside. And their babies might be teenagers but they're still their babies, and those parents will just have to try to remember the look of wonder when that kid encountered something new, or the warm linen scent of their hair and the sweet soapy glow in the space between the bath and bedtime, the delicious weight of children's arms wrapped so tightly around their necks because their children are gone and there's nothing they can do. And so now when I think of tile floors I think of danger and bathrooms and schools and parents and guns and shopping malls and hospitals and bullets and blood and red and childhood and death. I think of kitchens with blood red painted footprints. And I'm numb. I'm trying to think about how not to feel numb. This installation was part of the Green Window City Art Walk for 2018. The objective was to create a window display using recycled or discarded materials. I chose to use primarily junk mail and drinking straws in the construction of my piece. Included in this installation were hundreds of pieces of handmade paper made of 100% recycled material including junk mail, pay stubs, bank statements, gift wrap, aluminum foil and drinking straws. These sheets were then cut and machine-sewn together to create a landscape showing the integration of plastic and non-biodegradable materials into our natural world. Many of the pieces in this installation were formed into their shapes as wet sheets of paper including the giant clouds and all of the hanging flowers. There are two rows of “grass” paper made with green recycled paper and cut up straws from Starbucks. There are two rows of river made with blue recycled paper and gift bags. The sky in the background is entirely made of junk mail and blue pay stubs. 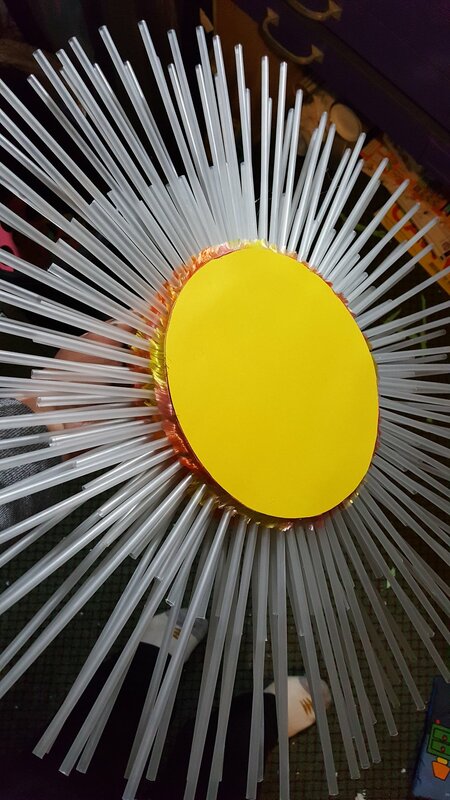 The sun is made using styrofoam and drinking straws and a single sheet of yellow paper. There are also more flowers made entirely of drinking straws that line the front of the window. Against the sky in the background is a form that is either a landfill with flowers growing on it or a mountain covered with trash and it’s up to the viewer to decide which they think it is. I made this installation to encourage people to think before they decide to use items that cannot be recycled (like disposable drinking straws) but also to see that even though plastic and trash permeate everything in our world, that the beauty of nature still finds a way to come through beneath the waste. Learn more about the Green Window City project here! Check out some pictures of the pieces in progress below! MATERIALS: Kozo fiber formed into handmade paper sheets hand-pressed together, pigments, mica, iridescent flakes, LED lights, foam core boards, gaffer tape, oscillating fan. "It comes in waves." she says. "But what is it?" he says back. "It is everything." she says. Be it water, light, energy, weather, seasons, emotions, love, breath, politics, change and even the brain. The ebb of life is what gives it its meaning; the highs and the lows, the good and the bad, the in and the out. The artist invites viewers to stand before the wave, take a minute, find its rhythm and let it wash over you...whatever it means to you at the time. Remember...you can never stay too long at the low point of your tides. This piece was made as part of a series of group gallery shows where the participating artists all use Kozo fiber as the main material in their pieces. 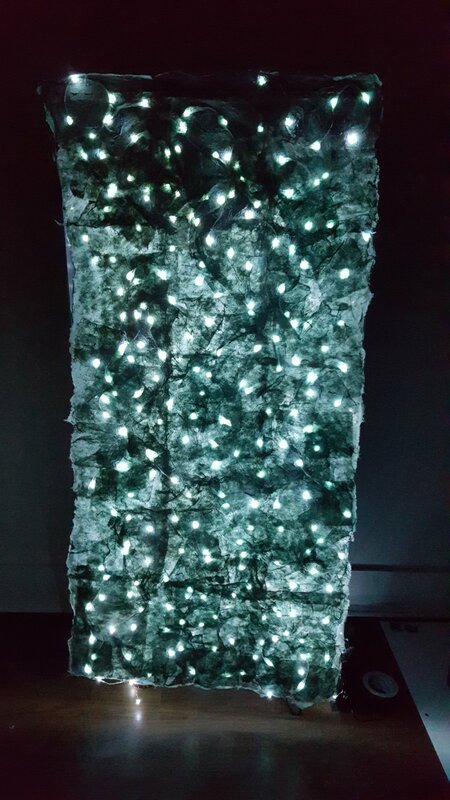 I made this installation by laminating a giant string of LED lights between layers of handmade Kozo fiber paper sheets. 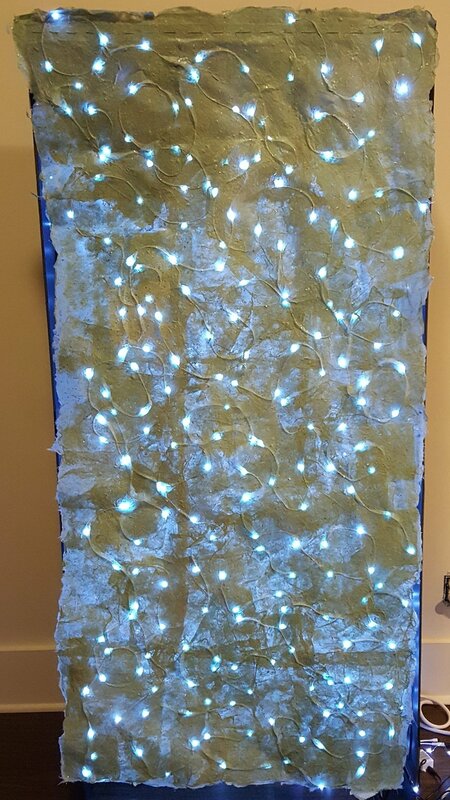 This larger sheet was then mounted on the front of a tall box with another string of LED lights behind it. There is an oscillating fan behind the front piece that causes the giant sheet of paper to move towards the viewer and then away inside the box, over and over, like it is breathing. The two strands of lights can be set to flash at different speeds. The displayed art had the lights in the front piece steady without flashing and the lights behind were flashing slightly faster than a resting heartrate. Viewers were encouraged to sit on the floor in front of the piece and to meditate as the art breathed and flashed its heartbeat. This is an art installation is called "Think in the Shade". 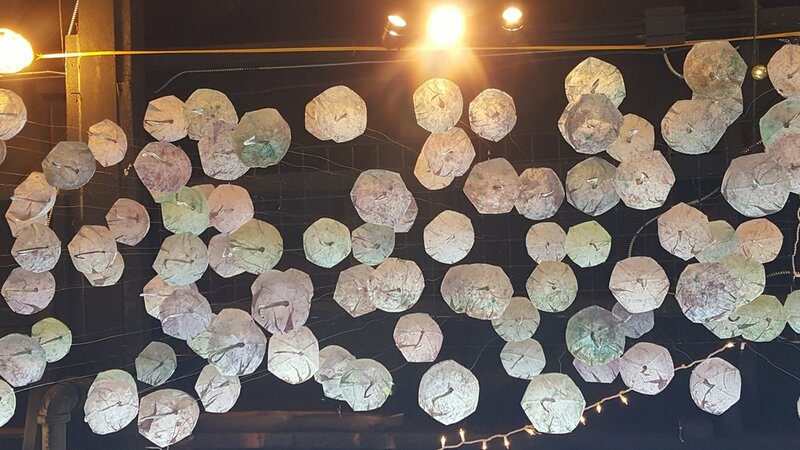 It is composed of over 100 handmade paper umbrellas suspended from the ceiling. 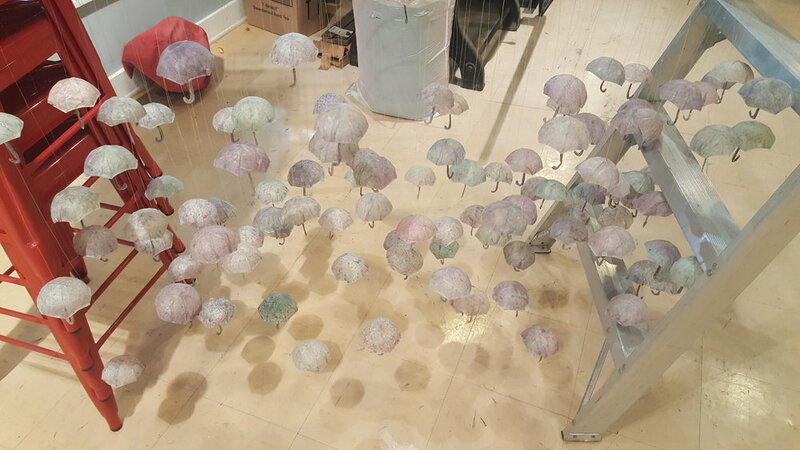 The paper is composed of kozo (mulberry) fiber and is hand dyed one sheet at a time and each sheet is dried over a mould to create the umbrella shapes. This piece was on display at the Western New York Book Arts Center during September 2017 for a group exhibition where all the artists used kozo fiber to create their pieces. It has since been sold to a private collector. According to Buddhist teachings, umbrellas have long symbolized enlightened beings, representing protection from suffering through knowledge of self. This project encourages the viewer to sit below the clouds of paper umbrellas, gazing upward and inward—taking a few moments to recognize the stillness of the mind and to seek protection through inner knowledge of the self. The world we live in today is so fast-paced, over-scheduled and in a constant stage of input. People rarely slow down long enough to begin to process all of the input, let alone to fully understand the knowledge they have been acquiring. My hope with this interactive installation is to foster a sense of peace through mindful meditation in a public space. Each participant is encouraged to write a brief response to his or her experience with the piece and to add it to the collection point near the installation. 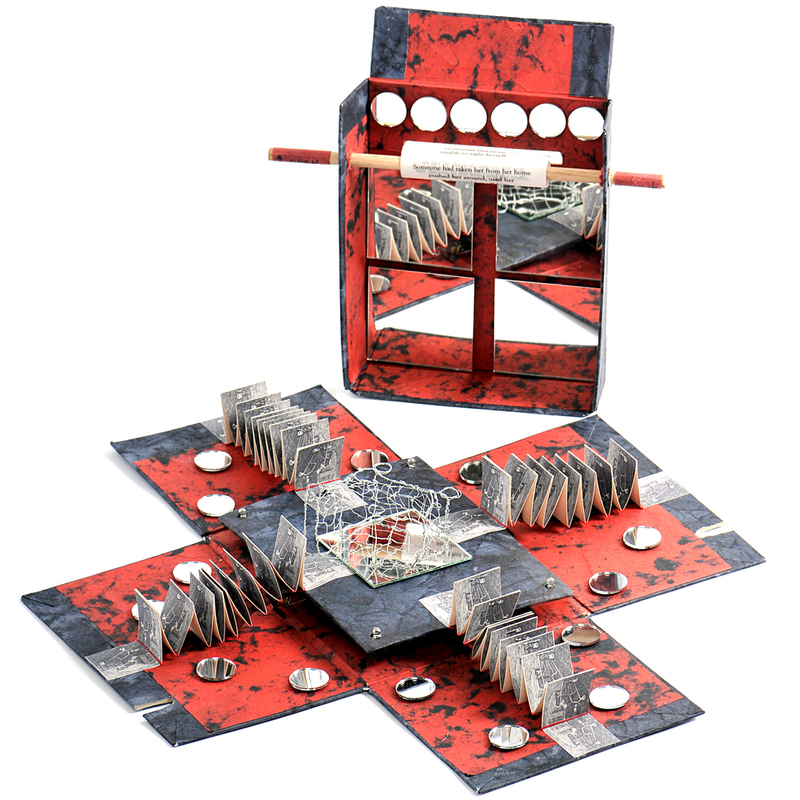 Abandon is a hand-constructed mirror-filled box with a retractable scroll built into the lid and working lights built into its circuit board base. A series of tiny accordion books expand from the center surrounding a hand-built wire mesh shopping cart. 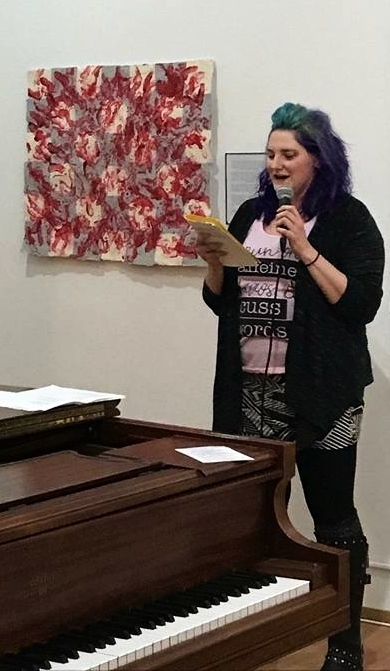 There is a poem printed on the scroll that the reader believes to be about an abandoned abused woman but in actuality she is just a shopping cart tipped over on the side of the road. My goal was to shed light, not only on the male or female aspect of inanimate objects but to human's attachment to these objects. This work directly addresses the cultural tendency to ignore the abuse of those less fortunate in our society, especially women. The "viewer" pulls the scroll out, reads the poem and when they hit the end of the scroll, they read the line: “What kind of person feels sorry for a shopping cart?” and then the lid pops off to reveal a mass of shopping carts tipped over surrounded my mirror images of the viewer’s face—showing them their own part in the piece and hopefully getting them to take a look at their reaction to their attachment to objects and their compassion for others. This book is my attempt to show others how my family is put together, you see...I have seven brothers and sisters but I'm an only child. I have step-siblings, half-siblings, step-parents, biological parents and there I am in the middle of all of it. I'm the only child between my biological mother and father but they each had children from other relationships and marriages who ended up being my siblings. I call it a nuclear-family reaction. This book tells the story of how it all happened and contains photos and memories of each person in my family. "I am scaling the center line, this middle link that holds two families together with a love far stronger than what has never held my parents together." Each block of text and each part of the tree and root images were all done by hand one at a time using photocopy transfers with Citre-Strip paint stripper and a burnisher. All the photos were printed with 80-year archival ink on an Epson photo printer. The papers used are handmade, hand-dyed Lokta papers from Nepal and all the pages and accordions were hand cut. This book was originally made as an edition of ten. Five of the books were completed and were gifted to the different households in my family so everyone can have one to look through to see how they are connected to all these other people through me. The other five books were almost completed when they were unfortunately destroyed in a fire in 2003. This series of three artist's books are all about my relationship with my mother. She passed away in 2002 and these books were a way for me to have one last little conversation with her. "I came from your dreams, I became your dreams, I regained my dreams when you died." This book is made of handmade banana leaf paper, handmade abaca and daylily paper (made by the artist), waxed Irish linen thread, PVA glue and ink and watercolor. It measures 3"x2" when closed, 3"x14" when fully opened. "We were one. Then we were two. Now we are one once again." This book is made from handmade silk sisal paper, coated cardstock (to give it a leathery appearance), photo paper and corners, vellum, copper wire ribbon, PVA glue and ink. It measures 3"x3" when closed, 3"x10" when opened. This book aims to show the love between a mother and daughter and how it continues to change and "bloom" as years pass. The general structure of this book is based on lotus folds but there are five lotus structures all glued together that fold into each other over and over until the book is closed. Then they unfold from each other over and over to open it. It is reminiscent of lotus flowers opening and blooming in the structure and the feel. The text throughout the book is like a conversation between mother an daughter with each part of the dialogue attached to the inside of each lotus. It is stored in a matching handmade kimono envelope with waxed Irish linen thread ties. This book is made from machine milled, gold screenprinted black and red Japanese paper, vellum, eyelets, PVA glue and non-glue adhesive. It measures 3"x3" when it is closed, 12" across and 6" high when fully opened. More Artist Book stories to come!